meet the princess, she's all Illuminati and the first piece in a solo series . this piece features a new functional design in which i explore the boundaries of hollow sections. As I sat studying the fresh new illuminati color tubing I picked up from a recent pull at baller section glass it came to me... We're connected. All of this is bigger than anyone of us. We have created a movement of glass and weed culture that is so revolutionary that future generations will be forever changed by our actions. By our perseverance to stand up for what we believe in. We were meant to be here doing this, right now. A statement kept repeating itself to me... "It's in my DNA".... I was born for this. HeLa is a representation of this idea, with a DNA strand rising from her head and an abstract leaf shield protecting her back. She is also a symbol of my personal evolution in the form of a blueprint I hope to continue to develop for many years to come. HeLa was also inspired by a book I listened to while working on this piece called "the immortal life of Henrietta Lacks". Great read if u have the time! :) BIG huge thank you to Aubrey at the Green Light district in Tigard OR for picking up this piece. Stop into her awesome store and see a brand new black light case for all things UV! April 2015 saw me in Austin Texas. I once again got to work with a dear friend of mine, a glassblower by the name of SALT. This is the first in a pair of Squidtress we made during my visit. This beautiful lady is adorned with Salt signature designs such as the soul window and rip curl stem. Recite three hail Mary's daily and they say you are sending a petition for purity of the self. Regardless of religion, authenticity is what leads to true purity. Authenticity is the daily practice of letting go of who we think we're supposed to be and embracing who we are. The "Illuminati Hail Mary" is the second in a series of three big collaborations I did my brother josh St. George. They say our ancestor Sir Saint George was a great slayer of dragons in the medieval times. Perhaps the courageous spirt of this go getter still resides in the heart of his descendants. Only by living a pure and authentic life, will we ever know for sure.... This piece was created in Evergreen Colorado in August 2015. "Twisted Twins" marks my strive toward better function in my work. This is the first piece in which I started experimenting with more scietiflc design concepts, pushing myself think about funcality without loosing the aesthetics that distinguish my works. This is also the first piece in which I have attached multiple heads, because we all know that two heads are always better than one. This piece was created in Evergreen Colorado in the fall of 2015. Photo by Lucid light photography. Introducing my latest solo work titled "The Three Fates"... It is said in Greek mythology that the Three Fates were three sisters who were the incarnations of fate and destiny. One sister spins the thread of life, the other sister determines the length of that thread or how long one must live, and the third sister chooses the way one must die by using her shears to cut the thread of life. It is said the sisters visit a newborn three days after one's birth to determine their fate. After a very inspiring conversation with one of my best friends Eusheen, I decided to begin putting in serious work in stepping up my function game. This is the second recycler design I've done so far. 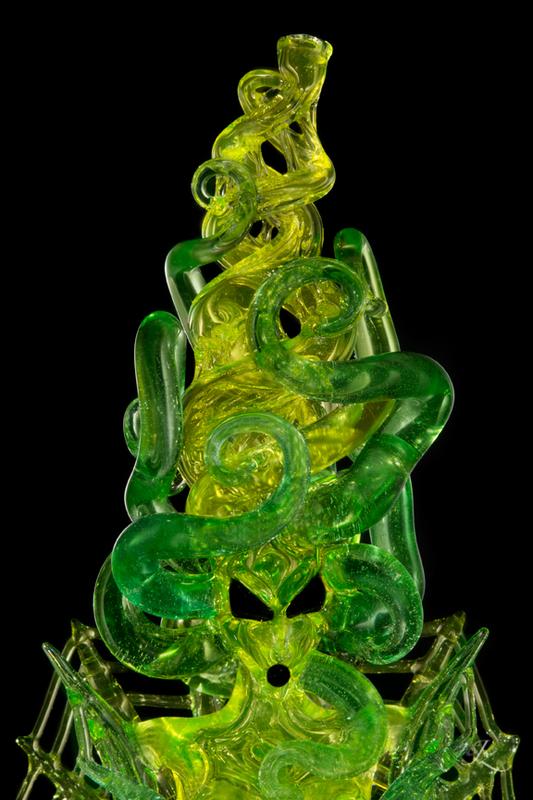 This piece is a 100% illuminati color combination and stands at over 19 inches tall. "People spend their whole lives trying to learn everything that exists beyond them, in hopes of finding what already lies within." The Light Seeker is a theatrical glass blowing performance portraying the personal transformation of a young bird goddess. Lacey’s Light Seeker is a 142 piece, functional glass installation sculpture assembled on stage alongside a choreographed performance including live dancers and sound design. Sound and music guide the young goddess through an on stage metamorphosis as she dances the trials and tribulations of her life... In this classic story of self-discovery the lines between artist and viewer blur as the captivated attendee becomes part of the creation by realizing they too are a seeker in their own journey, thus illuminating the true meaning the Light Seeker. No matter how harsh the winter... Spring always returns bringing the sun and birthing new life. No matter the adversity, a goddess will rise and blossom in beauty and strength and the all the evil in the world won't stand a chance against the power of her love. After a long hard winter in 2014, I found myself having visions of Springtime. Mrs. Purple haze came into my life like a wildflower sprouting though the last melt of snow, bringing hope for a bright and beautiful future. Flowers made by Michael Svenson. This piece was created in Evergreen CO. March 2015. Created in the winter of 2015 in my studio in Evergreen Colorado, "Cotton Candy Fairy" is a perfect example of of my transition into color. Prior to 2014 the majority of my work consisted of mainly dark and opaque colors of glass. The introduction of new transparent colors on the market reinvigorated my style of working, inspiring me to play with color gradients and explore the concepts of light and transparency. "Dark Angel" is a representation of the dark side that lurks in each and every one of us. She reminds us of one of life's simple truths... That only when we are within the darkness, can we see the stars. This piece was created in the spring of 2015 in Evergreen Colorado. "The Empress Of The Stars"
This is a collaboration I did with my brother Josh St. George. Most people don't know that my brother was my teacher and one of my biggest influences in glass. This piece was constructed in Sacramento CA, July 2015. "Gloria to the Red White and Blue"
Sometimes the thing we are most afraid of is the thing we are most prepared to battle. After 12 years on the torch I am still humbled by the glass daily. Working in 105 degree heat on the 4th of July in 2015, caused me to realize that sometimes at the end of the day the effort you gave will serve you more than the outcome. And if your willing to look deep inside you will come to understand that the process is more valuable than any product. She might have fallen that day, but the next day was a new day, with a new opportunity. 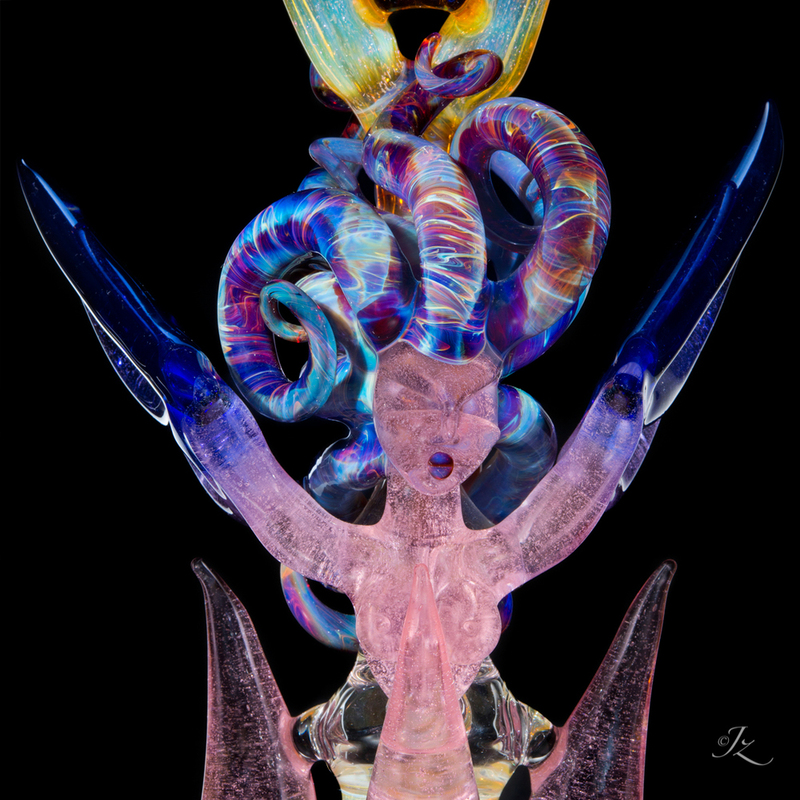 "Gloria to the Red White and Blue" was a collaboration with Justin and Colton from Funky Budda Glass in Spokane Washington. This piece was created during a charity event at West Coast Glass studio in Wenachee WA. I spent a good portion of the spring of 2015 down in Austin Texas. 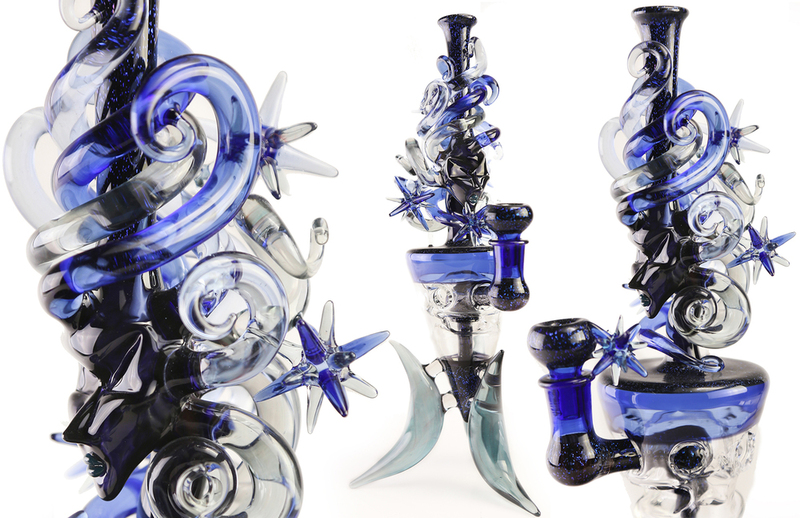 I got to work with a glassblower by the name of Jay Masse who is known for his classy sherlock style. April 2015 saw me in Austin Texas. I once again got to work with a dear friend of mine, a glassblower by the name of SALT. This is the second in a pair of Squidtress we made during my visit. This beautiful lady is adorned with Salt signature designs such as the soul window and rip curl stem. "Miss Pistachio" is a collaboration between myself and Dan Coyle. This piece was made during our glass demonstrations at Cornerstone glass in Eugene Oregon during the DFO #7 in June 2015. Tubing prep work made by my uncle Sam Avalon. Photo by Jamie Zill. The Ankh is the Hieroglyph for life itself. The great Queen Isis has always been depicted holding the ankh as a symbol of her eternal legacy, as her compassionate rule over Egypt has immortalized her in myth. "Queen Isis" is a collaboration between myself and Jason Burruss which we made in the spring of 2015 for the gallery show “Kings and Queens” by Jason Burruss and Annie Stardust, at the Oriental Theatre in Denver Colorado. This piece was constructed in Evergreen Colrado with all the wire work done by Jason Burruss. Rainbow child represents a new study in color I started in 2014. Previously, my work was mostly of the solid black nature. Very few of my works from 2010-2014 used transparent colors, however in 2014 all the new colors on the market proved to be very inspiring. I fell in love with the way the glass reflects the light of these bright new hues. These colors reinvigorated a new energy within my work, forging a new brighter era for the years to come. Flowers made by Michael Svenson. Constructed in Evergreen CO.
2014 Photo by Jamie Zill. I started making these twisty little sherlocks in the summer of 2015. These were the original four, with flowers made by Michael Svenson. Created in Evergreen Colorado. I spent a good portion of the spring of 2015 down in Austin Texas. 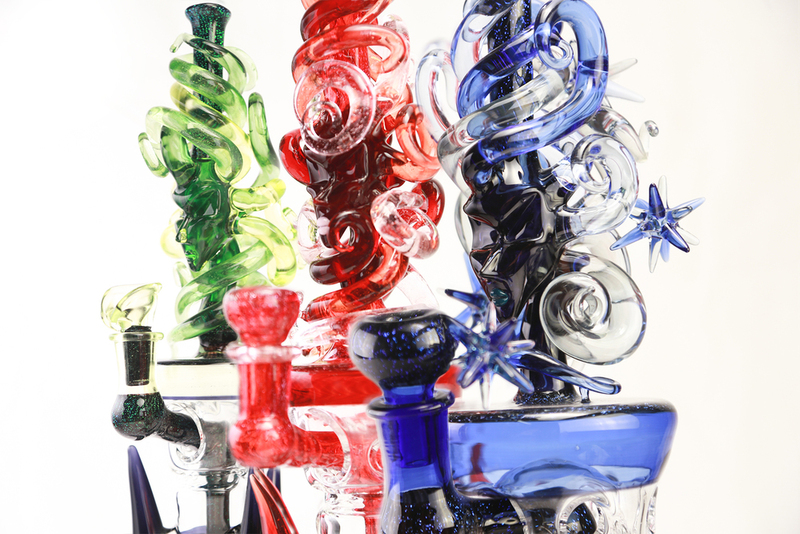 When I was there I got to work with a glassblower by the name of Snic. Jolex came to visit my studio in the spring of 2015 and the "Galactic Ginger Goddess is what resulted. Our styles seemed to flow effortlessly together in this work proving that in the end, we are all just dreamers in an infinite universe. This piece was constructed in Evergreen Colorado. 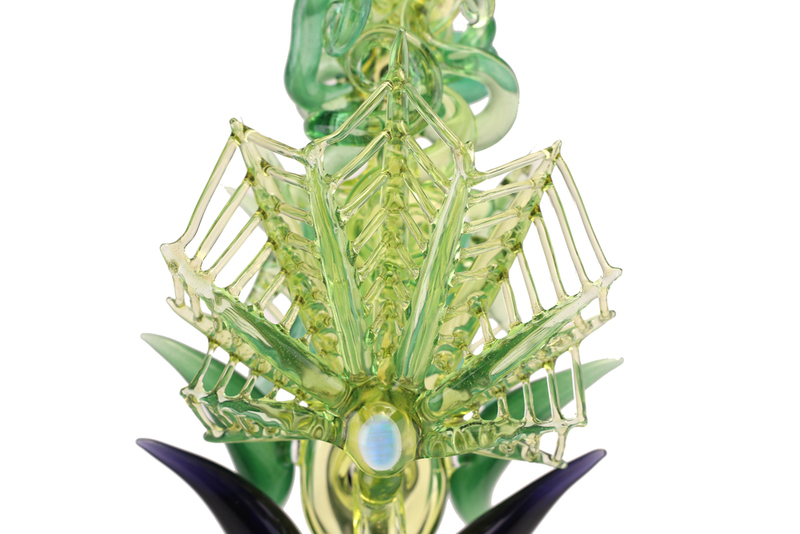 "The nestled Rose" happened when I got to work with one of my favorite glass artists John Kabuki. 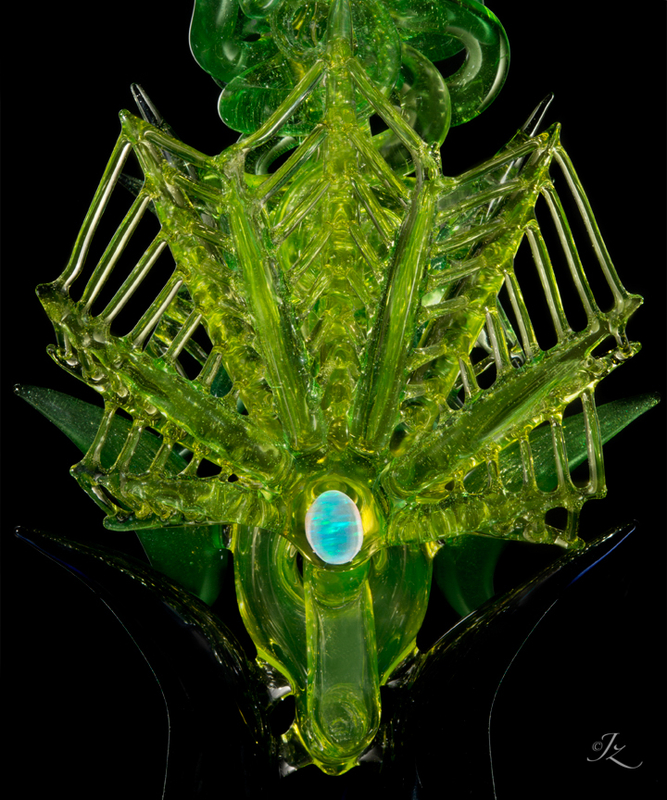 If you don't know about his work, and you want to know about OG glass you should follow this pioneer in the glass art world. All the trends we see now came out of work that was born by great artists breaking the rules of their day and they paved the way for all of us to do and share what we love. If you don't know where you came from, you'll never know where your going. Crated in Wenachee Washington July 2015, photo by John Kabuki. The beautiful emerald city on the bay, also known as Seattle is one of my favorite cities in the United States. A Summer road trip in 2015 brought me to the Seattle school of Boro to do a collaboration with Tim Cruthers aka, Ease and Nate Dizzle. Some of the prep work in this piece was made as early as 2005. "Trappeasa" was featured in Ease's gallery show titled "Old School" At Piece of Mind Smoke Shop located in the U district of Seattle. July 2015.